Capturing Emily's graduation memories was such a joy for me this past fall. Emily, a double major graduate of the University of Georgia, is a smart, talented lady that I have enjoyed getting to know over the years. Emily desired to have her graduation photos taken on the campus of UGA Griffin where she spent the last two years completing this phase of her education. We had such an enjoyable evening together and she sure did shine in her images. Congrats, Emily on all that you have worked so diligently to accomplish! You are a joy and a delight! 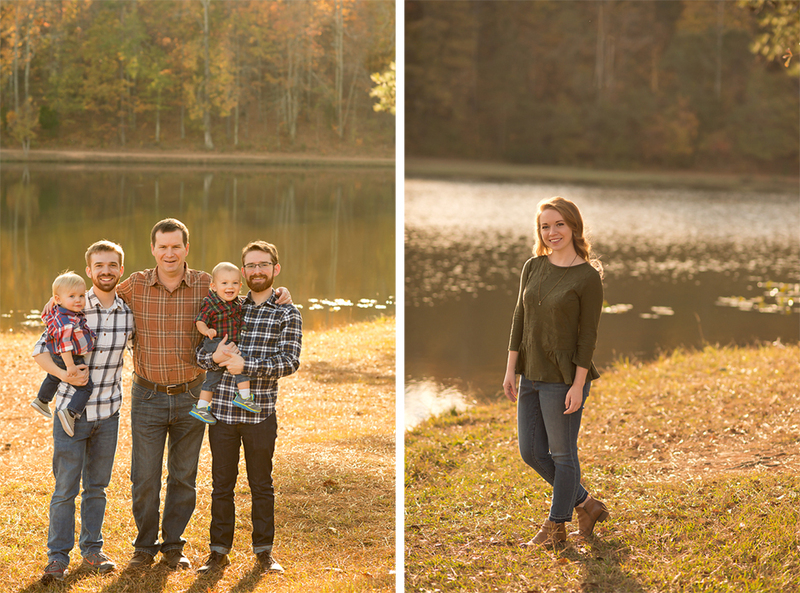 This sweet extended family was such a joy to photograph on this beautiful autumn day. With these many people and little ones, to boot, the session could not have gone better. Total pros, this lot. Thanks gang for an awesome time! To book your family session this fall reach out in the contact section of this website! The leaves are starting to turn! My daughter's recent winter formal was a great excuse to get her in front of the camera. We only had a few minutes because the weather was blustery and cold, so I had to shoot fast. It's always so rewarding to make the time to photograph my kids even in the briefest of circumstances. I love how these turned out with their unintended Shakespearian vibe. Of course I ordered prints of these immediately! I can't wait to display them. One of my favorite aspects of photographing individuals is the opportunity to capture layers of personality. Working with seniors allows me to do just that. I purpose to capture not only portraits for posterity but also to allow people to relax and be natural in front of the lens showing their souls more than just their smiles. This session was super fun because not only was I able to work with a senior, but a senior guy, a photographic first for me. Jackson was amazing in front of the camera! It is so hard to choose which images to share because I really loved them all. Thank you, Jackson, for a great session! More of this extended family session is coming soon! For now, how about a sneak peek of this adorable crew? This past October I traveled back to Thailand for a Mission's Trip to Bangkok, my old home. Upon arrival, I had an inquiry for a family session waiting for me as I waited for my baggage in the airport. The fun part of social media is that it allows you to "meet" and make friends with people from all over the world. I met Kathleen by way of her sister Courtney, a photographer friend that I only "knew" via professional development on the web. Kathleen and her family are living in Bangkok, Thailand serving our country's interests abroad. They are in the process of adopting and needed a few family photos for their applications. I was able to squeeze in a quick session with them before boarding the plane to return to the States. I so enjoyed this brief time with them capturing the energy of this family full of boys! Thank you, M Family for allowing me to help capture your memories as you grow your family! Mamas, it is important for these years of motherhood to be captured, so make sure to get in the frame with your babies. Contact me and let's start planning a session for you! Over the summer Caroline and her mom contacted me about getting some updated portraits for Caroline's upcoming start at Old Miss and sorority rush season. I love working with individuals, so I was so excited about getting some time with Caroline. Many freshman are beginning their college journeys this month, so this feels like a great time to highlight this gorgeous Old Miss Freshman! I hope you have an awesome year, Caroline! Can't wait to hear how it's going! Seniors, it's a great time to book your senior portraits as we head into the fall season! Reach out soon and reserve your space on my calendar. Collegiates, let's update your photos, too! Drop a line at kimcunninghamphotography@gmail.com! This past spring I had the joy of photographing the D Family. Not only are they fun, but they really love each other, and that makes for a wonderful session capturing their relationships. This image was a favorite of all and is now displayed in a gorgeous 20x30 canvas in their home! I just adore the way it captures their connections. These are just a few of my favorites from my time with this adorable family. Reach out in the contact form in the navigation tab to schedule your family session! I'd love to have your family in front of my lens! I recently had the pleasure of photographing this adorably funny family. Truly, they had the best personalities ever and made photographing them a joy! I'll be sharing more of their session in the coming weeks, but I just have to leave a sneak peek on the blog today. Sneak Peek for the gorgeous Kylee. More of her Senior Session will be coming soon! I just love both of these and can't decide which I love more! Can't wait to share more from this collection soon! Drop me a line if you are ready to get in front of my lens! Reach out under the contact form! It's time to start thinking about spring portraits sessions. I know, I can hardly believe that we are just a few days away from February and that Easter is March 27th this year! Spring is sneaking up on us quickly! With all this warm weather, we are bound to have an early blooming season. I am now booking spring sessions so that we can get your littles in front of the camera as soon as the sap starts rising. I'll begin taking spring portraits March 18th-April 30th. After that, you know Georgia flips to summer, so don't miss the soft greens, daffodils, and cherry blossoms that last just a few minutes, it seems. For more information on sessions with me, my home page offers a Client Guide that you can download. It covers everything you need to know, at a glance! Additionally, I would love to set up a time to consult with you on a spring session. You'll receive a welcome packet with additional information, and I'll walk you through my process and all of your questions! All sessions are booked with a $150 retainer fee which covers my time from consult to the night you see your images for the very first time. Prints, products, and files are sold separately. It's not often that I get to photograph my family on an outing. I usually opt to bring along my trusty iPhone to Instagram bits and bobs of our day. However, the day we went to Serenbe, in Chattahoochee Hills, was a gorgeous winter's day so I decided to bring the big guns! But, any camera is great to have when you are out and about. The best camera is the one you have on you! Serenbe is so unique. It's a combination of farm, residential living, and haven for creatives. You can even grab lunch while you are there! Now FYI, Serenbe does not allow professional photography sessions without a permit, but personal photographs of your visit are welcome! I came as a mom this day and just documented our fun as a family. I'm so glad I did! We had a blast! Family outings are definitely something we moms want to capture for posterity. Today, I'm going to share a few of my tips for documenting your family moments because I know you want memorable images of these happy golden years with your kids! 1. Catch the action! Nothing tells how it feels to be somewhere than action in your photographs. 2. Photograph the details that make a location special. The animals at Serenbe are part of the charm, so I wanted to include them. 3. Capture what it feels like to be there. Ok, this is a big one! So many times, as parents documenting our fun, we ask our kids to stop the fun and smile for the camera. And we give that dreaded request, "say cheese!" The smiles are cute, but there is no sense of the experience in those photographs. Don't ask your kids to pose all the time, just capture them as they are. This makes for a more memorable photograph of your day. 4. Utilize the landscapes and structures around you. Many people, when they see something neat-o, just take a picture of that neat-o thing. But, I think you should put your family into the neat-o thing for a more memorable image. Years from now, you may not remember why you thought something was neat-o, but you will love that you have the image of your family! 5. Now, grab a few smiles! Smiles and poses are fine and dandy as a part of your day and help tell the story. They just aren't the whole story! So, use these request to smile and make eye contact for when it counts. Bonus tip: Forget perfection! Be present in your day and just look for the opportunity to apply some of these tips when you do bring out the camera. Don't worry about smudges on faces, messy hair, and mud on the pants. This is real and real is okay! So, that's 5 tips and a bonus for capturing memorable photos of your family on an outing! I have more tips to share in my free download on how to take better photos of your kids! Head over to the link and get your download! I had the pleasure of photographing the C Family for their Christmas card photos back in early November and is my custom, I hold off on sharing Christmas card sessions until cards go out to prevent spoilers. Since there is just one week to go until Christmas, I think we are safe! I had so much fun photographing this cutie patootie family with their perfect outfit coordination! They did a wonderful job bringing together a cohesive look! Thanks C Family for a fun light-filled mini-session! Their friends can catch their favorites on their Christmas cards! Let's capture your crew in 2016! I'm now booking for winter and spring sessions. January is a great time to bundle up the kids in their fresh winter wear for an outdoor session capturing the nostalgia of childhood outdoors. Let's capture those toboggans, mittens, and boots! Head over to the pricing page to download your copy of my 2016 Client Guide! What a joy and privileged it was to work with this precious family. It's been wonderful watching this family come together over time. This dear sweet Mama and her girls have brought so much joy to our community. It was a honor to serve them capturing their history in the making. Thanks Girls for letting me stop by to capture your "right now". I loved every minute. Want to have me capture your "right now"? Let's work on that! Head up to the contact tab and reach out! Looking for a perfect gift for that special someone? Wow them with a gift certificate for a portrait session in their stocking! This year I am offering gift certificates for that perfectly special gift! Don't just buy something that will get tossed in a drawer this year. Give the gift of memories! Portraits are the perfect gift that will bring joy year after year as they beautifully hang on the walls of our homes reminding us of what is truly important. As a mama, I can't think of anything better than seeing my kids captured professionally and their sweet faces adorning my walls. $150 provides your recipient a one hour portrait session with me that they can use anytime in 2016! You can also add on print credits in any value that can be applied to collections, prints and products after the session! The gift of memories and heirlooms will be the gift that everyone will love this season. Your gift certificate will come with a gorgeous Kraft presentation envelope to make this gift truly special to receive. Contact me today and purchase a gift certificate for your loved ones! Shopping for the perfect gift has never been easier! Contact me via the contact form in the navigation bar above or email me at kimcunninghamphotography_at_gmail.com. *Minimum purchase of $150 covers a portrait session and does not include prints, products, or digital files. You may add on credits for collections, prints, products, and digital files in any denomination. Gift certificates will be available all year for all occassions! My Sister In Law and Brother In Law came for a visit last month. 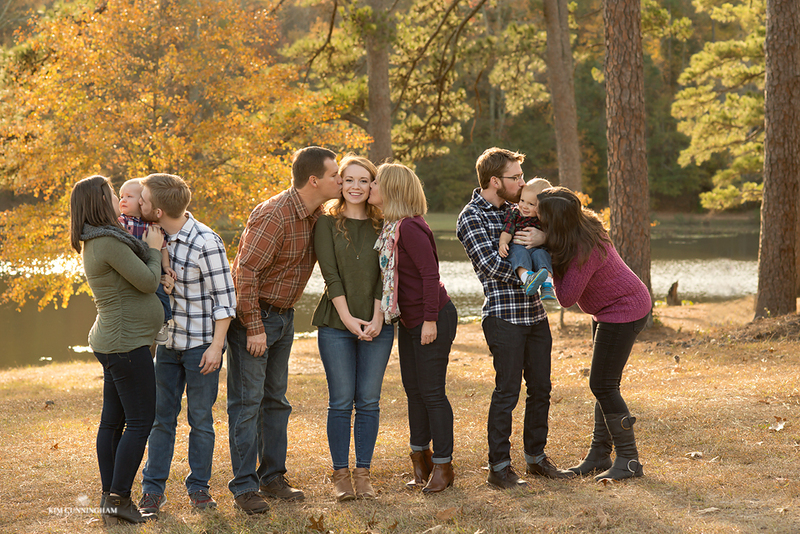 It was the perfect opportunity to grab an hour to update their family photos! They brought their camper along and stayed at Chattahoochee Bend State Park, so naturally we held our session there. These are a few of my favorites from our time. Thanks guys for getting in front of my lens and letting me capture your relationship! I had so much fun preserving your memories. If you would like to preserve your own memories, drop me a line and let's get to planning! It's been a little quiet around here lately because we are in a seasons of transitions. The main transition for us has been getting this girl into her high school routine. Yep, my firstborn is a high school Freshman! When did this happen? Seriously! I decided to take a little time to focus on the big family moments that are happening in our lives, because Mamas, that's what being a Mama is all about. Time moves so quickly in these child-raising years. If we blink, we miss it. I mean, I blinked and my firstborn grew 4 inches in 6 months! I'm not even kidding. She is changing and I tell myself to grab my camera and capture her fast before she changes once again. I'll never regret taking a couple months to ensure that her high school road was well paved with a present mother helping her navigate the gap from being exclusively home-schooled to schooling outside of our home. It's been an amazing start! Additionally, this time off has given me time to think about my business and what I most want to accomplish with it. I keep coming back time and time again to creating heirlooms for you! You know why? Your babies are growing at warp speed just like mine. You blink and they are grown. While we can't ever slow the process down, we can freeze the moments through photography. This image, though a casual home grown one, will be precious to me when she is a mama with littles of her own. That's what I most want to give you...precious frozen time. But, I don't want to just give you digital files that sit on your hard drives waiting for the free time to print them that rarely comes. I'm a photographer and I don't always get around to printing my images! You and I both know that we are investing our free moments caring for our families. Isn't that what we do, as Mamas? Over the last two years I have studied the art of preparing and printing wall art, just for you. Portraits are your legacy, not just some garbled information on your computer that will be useless as soon as technology changes, or heaven forbid you accidentally delete it! Anyone remember floppy disks or VHS? Prints are forever! There is something so very different about holding a gorgeous custom print in your hand that viewing on a device cannot deliver. In 2016, I'm shaking things up a bit by personalizing your experience even more. I will be sharing this with you as 2016 approaches. My 2016 Client Guide will be ready to send out in November for the upcoming year. Take a moment to add your name to my newsletter list to be one of the first to hear about the changes coming your way. I tell you, I'm really excited about what's to come. Think personal and professional service with products you will treasure hanging on your walls. Of course, those digi-files will still be around for those needs, but in 2016 we are going to print and we are going large! I love having clients that come back over the years for portraits. What a joy it is to watch families change and grow with time! The privileged of having the J family in front of my lens once again was all mine because I just love chronicling what will be history. This time there was a new addition who is just so stinking cute! It's hard not to love each of these beautiful kids and their personalities! Their parents are pretty great, too. Thanks guys for letting me capture your beautiful family and memories once again! I just love your joyful gallery! Want to get in front of my lens in 2015? I'm taking a very limited amount of sessions for the rest of 2015, so reach out and let's make it happen! Simply submit an inquiry via the contact tab on the blog and let's start planning! This.Precious.Couple. What a joy to have the honor of photographing them in celebration of their 30th wedding anniversary! When I think of words to describe them I think of: humility, generosity, thankful, encouraging, serving, giving, loving, and FUN! And there are so many more words to describe them that would keep me here all day. To know them is to love them. This couple is truly the gem and hidden treasure of our church. They have given themselves tirelessly to the children's ministry which just pours love into our kids. I know I speak for all parents at our church when I say thank you is just not enough. They don't do it for thanks, and that's why they are perfectly placed right where they are. Happy Anniversary to you, Clay and Maria! If you are looking to capture your special milestones, reach out for a space on my calendar this year!